This production opened on April 29, 2005 and closed on May 8, 2005. Folk meets Shakespeare: Folktown! 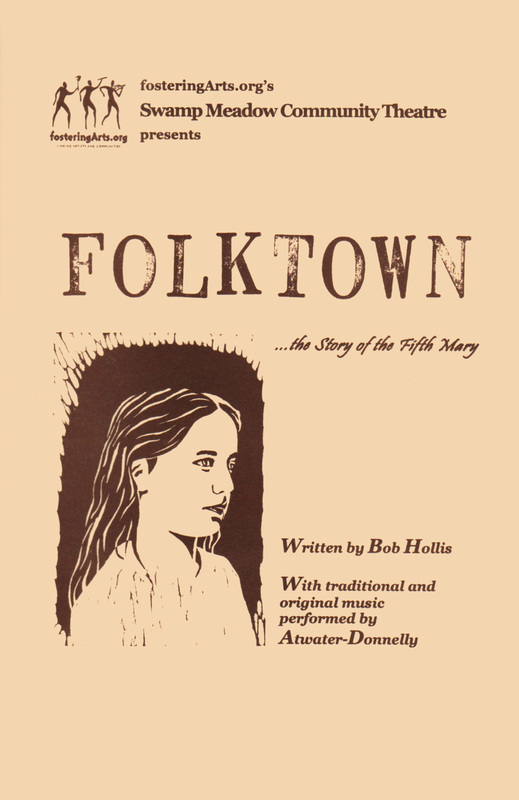 In April 2005 the Swamp Meadow Community Theatre (SMCT) premiered Folktown: The Story of the Fifth Mary written by Robert Hollis in collaboration with musicians Aubrey Atwater and Elwood Donnelly. Folktown tells the story of a young girl who learns to trust the song in her heart to lead her through life’s twists and turns. It is told through music, dance, puppetry and elaborate sets. This new, original work was written around the stories and music of 22 traditional American and Celtic folk songs. Folktown begins with the ancient Scottish ballad Mary Hamilton in which Mary casts her baby out to sea stating, “Sink ye or swim ye, my bonnie wee child, but be no more with me.” The baby (the Fifth Mary) lives and floats to the land of music where she is found and raised by the music gods. The rest of the play follows her as she returns to her homeland and travels the same tragic path that killed her mother. Along the way she meets up with characters that represent many archetypes of human behavior. In the end she finds strength, compassion, peace, power, forgiveness and love by listening to and singing her song. In developing the play Hollis looked to provide an enjoyable evening of music, song, dance, puppetry and theater, and to move audiences with the heart-warming, new sequel to the age-old story of the Four Marys. He explained, “I hope to provide cast, crew and audience with an in-depth folk music experience and to help preserve the tradition and stories inherent in the music. I ultimately wanted to create a story that provided a role model for my daughter. Audiences will laugh, cry, and even get angry, but will leave feeling uplifted and empowered.” All performances of Folktown featured professional musicians and singers Aubrey Atwater and Elwood Donnelly.